Another HP originally created for the Travel Retail market in 2010. Having been superseded by the Warrior series, old stock of the 1998, 1994, 2001 and 1990 can sometimes be found in standard whisky shops like The Whisky Exchange. I grabbed this bottle quickly because a) I’m a HP fan and b) this old release wont be available for long. At 85/100 in the Whisky Bible, this malt just squeezes into the category of “very good to excellent whisky definitely worth buying” but the author says “though pleasant, disappointing by HP standards”. Sometimes having high standards can be a rod for a distillery’s back. If this malt had been by the Speyburn or Speyside distillery it would score in the 90s simply by comparison to their usual output. Nevertheless, this 1998, bottled in 2010, compares very favourably with the standard HP 12-year-old, which only scores 78/100 in the Whisky Bible. But, just to confuse matters, Whiskybase score the standard 12yo 82.44/100, which is slightly more than what they give to this 1998 release. 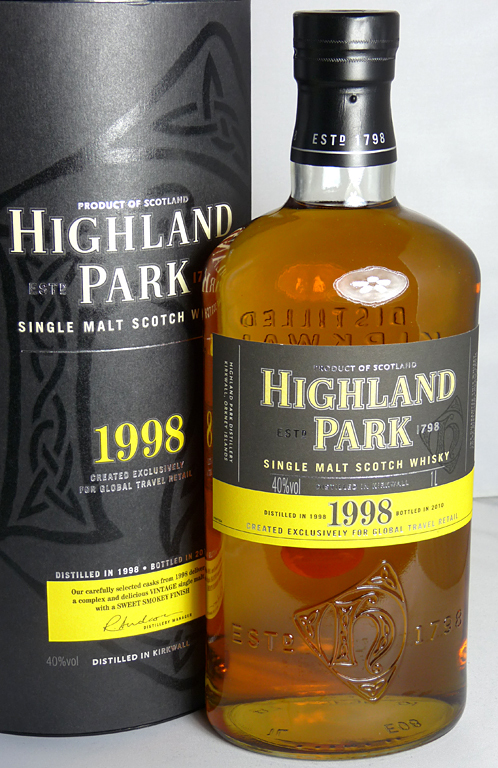 This entry was posted in Highland Park and tagged 100cl, 12yo, 1998, 40%, Highland Park, Islands, Orkney, Single Malt, Travel Retail, Whisky Exchange. Bookmark the permalink.